How to add a dynamic columns while retrieving values from two tables using sql or pl/sql? Write a PL/SQL procedure called print_publication that print a list of publication records for each publication by an author name as parameter input. You should sort the name of the author for the publication in ascending order and follow by the year of publication (earliest first). The following is the query and code attached to the query.I am not able to figure out how to use the date 31-dec-2006 in the problem. The issue is that Im not receiving any results for this query. I believe I am doing something wrong in the where statement. Im not sure how to assigne a value to the date. select rp_street, rp_city, rp_state, rp_type, (rp_datelisted - sysdate) as "Number of Days Listed"
I can't see any output. what can I do? And second is if so which is best or is there a better / working alternative? Essentially want all project id's and records with null to be returned. I have come across the following interesting situation in SQL. I am looking for help/advice to solve this situation from experts here. I have two tables, Table1 and Table2. 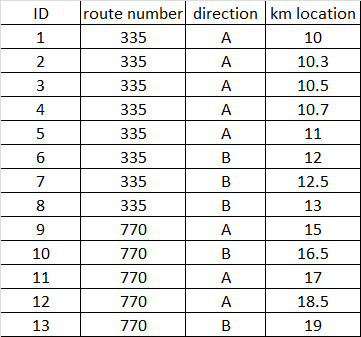 I would like to join the two tables based on route number, direction fields and populate "KM location field" of table2 dynamically in between the range of fields "KM from" & "KM to" of table 1. I tried simple join between two tables but I encounter having duplicate entries of route id of table1 for all matching tuples. Your thoughts please!